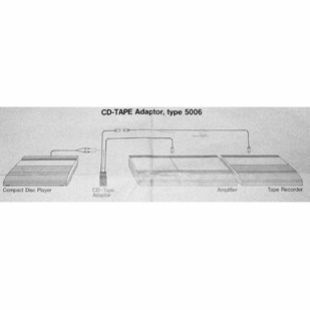 The CD-TAPE adaptor enables you to connect both a compact disc player and a tape recorder to your amplifier at the same time even if the amplifier has only one TAPE input. 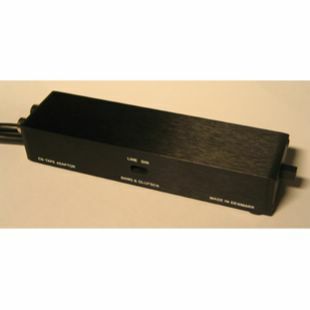 Connect the long cable with a DIN plug to the TAPE input on the amplifier. 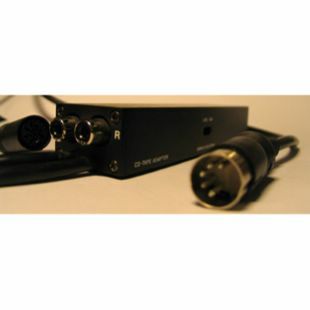 Connect the short cable with a DIN plug (female) to the tape recorder cable. Plug the cable with phono plugs attached to the compact disc player into the sockets on the CD-TAPE adaptor: L to L (left channel) and R to R (right channel). Set the switch marked "DIN-LINE" on the side of the CD-TAPE adaptor in the position required for the signal level of your tape recorder. Press in the push-button on the CD-TAPE adaptor when playing compact disc player. When playing the tape recorder, the button must be released. If you record a compact disc on the tape recorder, the button must also be pressed in. The CD-TAPE adaptor is specially desgined to fit the Beogram CD X, a Bang & Olufsen compact disc player. This means it can be placed underneath the Beogram to the right and thus be almost invisible, without impeding the operation of the push-button.